Click here to read all my TAST posts. I was not expecting any fireworks from these first-half figures, and TAST duly delivered a rather dismal — but not completely disastrous — performance. I must confess, the figures were disappointing after the second-half ‘glimmers of hope’ I mentioned back in March. My sums suggest the average TAST restaurant generated annualised revenue of £742k during this first half — down 4.1% on the comparable half of 2017. 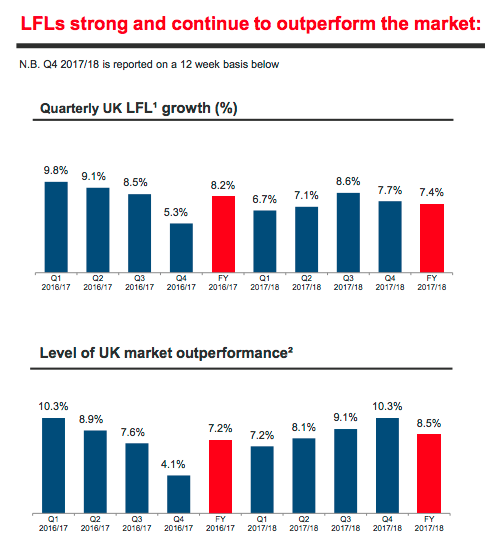 TAST’s performance was reasonably similar to the 3.7% like-for-like sales decline experienced by sector barometer Restaurant Group for the same 26 weeks. Clearly some dining concepts remain attractive — “challenging” industry conditions or not. At least TAST’s directors continue to follow up the action items listed within the 2017 annual statement. The closure of TAST’s sole Centuno restaurant was not mentioned within the statement. I had hoped this new dining format could have inspired a rebranding of some of the group’s struggling Wildwood outlets. 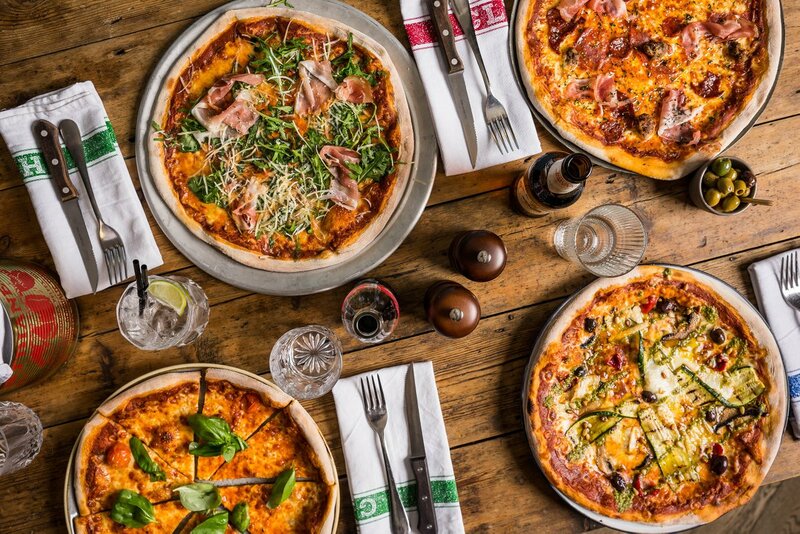 However, management has told me that, while Centuno’s food had impressed many customers, the economics of the menu and the Highgate site could not combine to produce an adequate return. 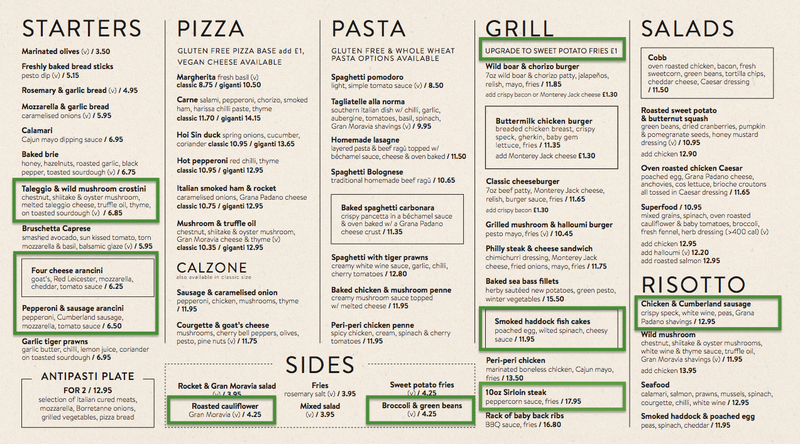 Menu prices have generally risen. For example, a baked brie starter has climbed 40p to £6.50(! ), a side of fries has gained 25p to £3.95, spaghetti with tiger prawns has advanced 80p to £12.65 while an 8oz Sirloin steak has surged 100p to £16.95. Notable within these results was the aforementioned ‘Food offering’ replacing ‘Re-connect with customers’ on management’s to-do list. There was no similar statement this time. …but then a new-look marketing email arrived just the other day — which mentioned a 30%-off food voucher. I suppose giving up the discount vouchers has proved too difficult for TAST, and I continue to speculate whether many of the chain’s diners will ever pay ‘full price’ again. I am hopeful the £300k savings will soon emerge and help TAST return to profitability. Some £10.3m of property, plant and equipment was written off during the half, and followed £9.5m written off during 2017. TAST reported fixed assets of £34m at the start of 2017 — which implies almost 60% of the money spent on creating the restaurant estate has effectively been wasted. I suppose the write-offs may also mean nearly 60% of the group’s sites now have little hope of ever reaching their original profit potential. Each outlet currently sports an average £228k book value. I can only trust the outflow is purely a timing issue (enquiries have been made). However, I do wonder whether suppliers have tightened their credit terms given the high-profile closures within the restaurant sector. At least the £4m proceeds from the various site sales announced six months ago were collected. I also note first-half capex was just £670k — below (my estimated) £931k depreciation charge. It all left cash in the bank at £2.9m, and with borrowings still at £7.0m, net debt ended the half at £4.1m. I guess “continuing to review our funding arrangements” does not rule out raising money by issuing more shares. The annual report small-print did nothing to rule out an equity raise either. I have to admit, a share placing would seem quite likely should net debt stay at £4m and losses continue. I can’t say raising extra money will do much for the share price. Oh dear. Six months on, profits have turned to losses and net debt is £3m higher than I had expected. Right now I can only trust the board’s action plan will quickly reinstate profits and generate enough cash to reduce those borrowings. In the past I have mentioned the following recovery scenario: closed units cut revenue by 20% to £40m and other actions help improve the group’s operating margin to 5% and generate a £2m operating profit. Right now, you could argue the present £13m enterprise value (market cap plus net debt) prices in some of that recovery scenario. A lot now rests on TAST’s second-half performance — I would just be happy if sales can stabilise, profits can be restored and debt can be reduced to lower the chance of an emergency fund raising. For the last eighteen months I have banged the drum for the Kaye family management, which in total owns 40% of the business and has already built and sold multi-bagger chains ASK Central for £223m (in 2004) and Prezzo for £304m (in 2015). Suffice to say, my TAST conviction remains dependent on the Kayes. I just hope I will not have to bang the drum for another eighteen months before any proper evidence of a turnaround appears. Punt sounds an apt description right now. I mentioned in the Blog post above that “cash flow was not great following an adverse £2.7m creditor movement“. Enquiries have now been made and, apparently, TAST’s December 2017 trade creditors included £2m that related to “new site openings… and electricity bills“. Furthermore, the company expects the December 2018 trade-creditor balance to be higher than that seen at June 2018 due to Christmas trading. However, the December 2018 trade-creditor balance will not be greater than the comparable December 2017 figure because of “lower capex” (no new site openings) and a “smaller estate” (presumably lower utility bills). What this means (at least to me) is that there should be a partial reversal of the trade-creditor movement during the second half. But I get the feeling cash conversion for the year as a whole may not be great. It seems a not insignificant amount of the group’s reported December 2017 cash was owed to suppliers for fitting out new sites and, as the expansion plan has been scrapped, the group can no longer balance the trade-creditor book by engaging more fit-out work. At least this unwinding of the trade-creditor balance should be a ‘one off’ — the owed suppliers should be paid off this year. Next year ought to witness a more even trade-creditor movement — assuming no new sites are opened. Tasty is pleased to announce that it has today entered into an agreement to revise its £7.0 million term loan facility with its existing lender Barclays plc (the “Revised Loan Facility”) which amends the Company’s existing £7.0 million term loan facility (the “2016 Term Loan Facility”). The key effects of the Revised Loan Facility are to extend the final repayment date from July 2021 to March 2022 and to significantly reduce the quarterly repayments with effect from July 2019. Under the terms of the Revised Loan Facility agreement, the Company is to pay interest on the amount drawn down (which is currently approximately £6.4 million) of between 2.5% and 4% over LIBOR with the interest rate payable dependent upon the ratio of the amount drawn down to adjusted EBITDA. In addition to the quarterly repayments referred to above, the Company has undertaken to reduce the amount drawn down under the Revised Loan Facility by an aggregate of £1.1 million on or before 30 June 2019. Of this £1.1 million, the Directors have undertaken to provide, in aggregate, £0.5 million of new capital into the business by 30 June 2019. This new capital is to be in the form of either new subordinated loan or equity capital, or a combination of the two. As at 31 October 2018, the Company had cash balances of approximately £2.1 million. Barclays appears to have asked TAST to pay down its loan facility in exchange for extended terms. At the June half-year, TAST had maxed out its loan facility of £7m. Cash of £2.9m then left net debt as £4.1m. This latest statement said debt was £6.4m and cash was £2.1m. So net debt is £4.3m — just a £0.2m increase during July, August, September and October. 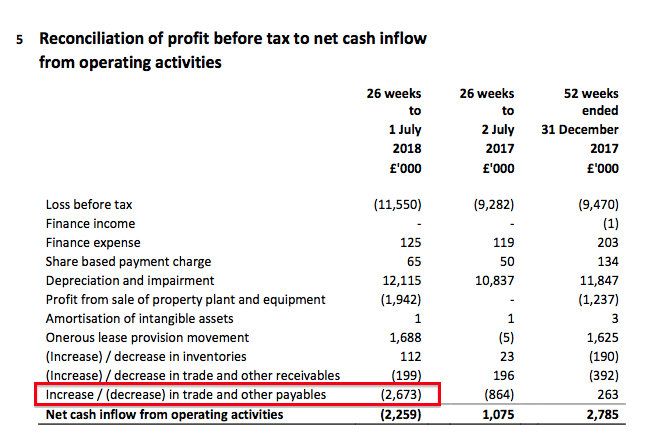 Ideally TAST should be not be losing money, but the cash outflow appears much better over those four months than the underlying £3m haemorrhaged during the first half. I would add that the very warm weather during July and August may not have helped TAST’s trade. So from piecing all these snippets together, I think — or pray! — TAST’s situation has improved. That apparent improvement is hopefully why Barclays has extended the loan term. The new interest rate of “between 2.5% and 4% over LIBOR” compares with “1.7% above LIBOR plus a variable charge for mandatory associated costs of the lender for all amounts drawn down, with a 0.68% charge on any amounts of the facility that is not drawn down” as cited in the 2017 annual report. TAST’s H1 figures showed interest costs of £125k, of which £34k related to an unused £5m facility (since cancelled). So £91k on £7m debt for six months = 2.6% annualised interest. TAST will reduce its borrowings by £1.1m before 30 June 2019, so perhaps debt could be £5.3m at that point. Paying £182k interest a year on £5.3m equates to 3.4% interest. So I guess to “significantly reduce the quarterly repayments“, the rate payable on the facility would have to be closer to the 2.5% over LIBOR minimum of the revised band. Of the aforementioned £1.1m debt reduction, £0.5m will come from the directors. I am hoping some of the remaining £0.6m will come from cash flow over the busier Xmas period rather than all of it from the existing cash pile. Worst case for that £0.5m is shares perhaps issued at 10p giving 5m shares, which would increase the share count by 8%. All told, this statement does not seem to be a complete disaster and I am encouraged the cash outflow appears to have narrowed. There may be some chance the business could be cash flow positive during Q4. My abiding thought is that the Kaye family’s strategy has always been to use quoted companies to build and then sell chains. If TAST goes under, I dare say the Kaye family will find it very hard to find new stock-market backers. I would like to think the Kayes are pulling some levers in the background — perhaps re-jigging some lease arrangements with TAST — to ensure the business pulls through, then recovers, and the family’s reputation remains somewhat intact. I suppose you’ve seen the news that Richoux is de-listing from AIM. While I can understand why they’ve taken that decision (Richoux was simply too small to survive as a listed entity), it does give cause for concern that Tasty could possibly be next if the situation doesn’t improve there. Like at Tasty, management disposed of some of their property portfolio prior to this action, but it wasn’t enough to stabilise things. I suppose the fear here is that just how many rabbits are left in the hat for the Kaye’s to pull out to rescue things here? The one thing that does give me some hope here is that the raft of site closures that we saw between end of 2017 and the start of 2018 has slowed. Interestingly, no sites appear to have closed this January (this time last year, we saw a few) and since March 2018 and now, we have went down from 61 locations to 59. Thanks for the Comment. Yes, I did see the news but SharePad work got in the way. For context, RIC had first-half sales of £5m last year while TAST had £20m-plus. So RIC is much smaller. Also, I attended the RIC AGM last year (the only shareholder) and spoke to chief exec Jonathan Kaye for some time. I did not post a recap then as the conversation was after the formal meeting and therefore not really for publication. However, I think I can now publish my thoughts given the de-listing. I asked Mr Kaye why he had taken the job at RIC and not started a chain from new. He said the existing head office/estate ‘infrastructure’ at RIC was helpful. He also mentioned how his uncle, Philip Kaye, had jokingly (I think) mentioned he could take on RIC now that he had sold Prezzo and had nothing to do (Philip Kaye is a large RIC shareholder). All told, I got the impression Mr Kaye took on RIC with perhaps not as much passion as he did when starting out with Prezzo. Also, it was clear Mr Kaye had found RIC much harder to sort out than he had imagined. The Richoux outlets in London where stuck on high rents and could not deliver the lunch/evening revenue (from ‘high teas’) that a normal restaurant could. I mentioned Patisserie Valerie could make a lot from cakes, and he said that was perhaps due to their take-away offer and different property formats. (In hindsight, I now feel he was not quite sure how PV was doing so well). Mr Kaye said the Friendly Phil’s and Villagio formats were alright, but nothing special. The big plan was to roll-out the Broadwick format, of which there were just two sites at the time. He also confirmed the firm needed to raise money. Anyway, I left the meeting with a greater understanding of restaurants etc, and with the feeling Mr Kaye had a lot of work to do. Good point on the lack of closures at TAST, although that could be because TAST cannot exit from the leases or no buyer has been found. I noticed a lack of social-media posts touting discounts during December, which I hope bodes well for TAST’s Xmas trade. No trading statement from TAST about Xmas as yet, which is generally the case. If nothing is released during the next week or two, I think we can assume H2 trading was ‘in line’. Hopefully the weather during February/March will be a lot better than last year’s snow, which could make this H1 performance a little better, too. The Kayes have said they will pump £0.5m into TAST via loans or equity. I am hopeful that is the only rabbit needed to be pulled. I think people eating out remains a growth trend, but greater capacity and the subsequent shakeout is sorting the wheat from the chaff. Wagamama and Nandos are still doing well, which tells you the problems have been due to poor dining formats. Downside for TAST from here is still 100%, but the firm’s latest statement did not seem too awful. 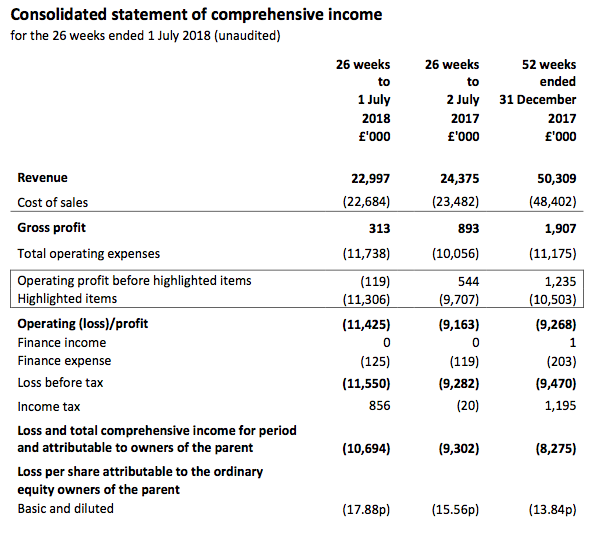 Cash flow in particular seems to have improved, and I will take a £0.5m injection from the directors if that is all that is needed to see the business through to cash flow breakeven. This year restaurants in general suffered badly due to extreme weather and the World Cup, which perhaps exacerbated the sector’s difficulties. Next year we have Brexit of course, but I would like to think TAST’s and the sector’s difficulties are reflected in the share price. 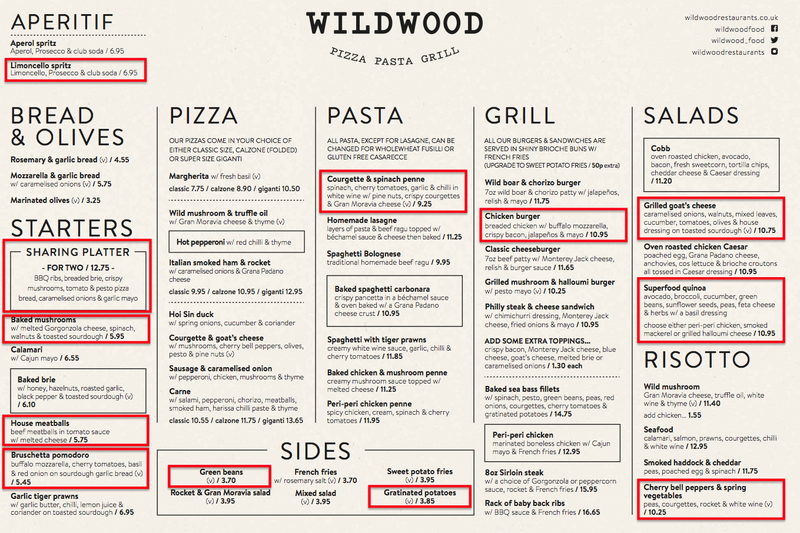 I mentioned within the blog post above that TAST had changed its Wildwood menu during July 2018. 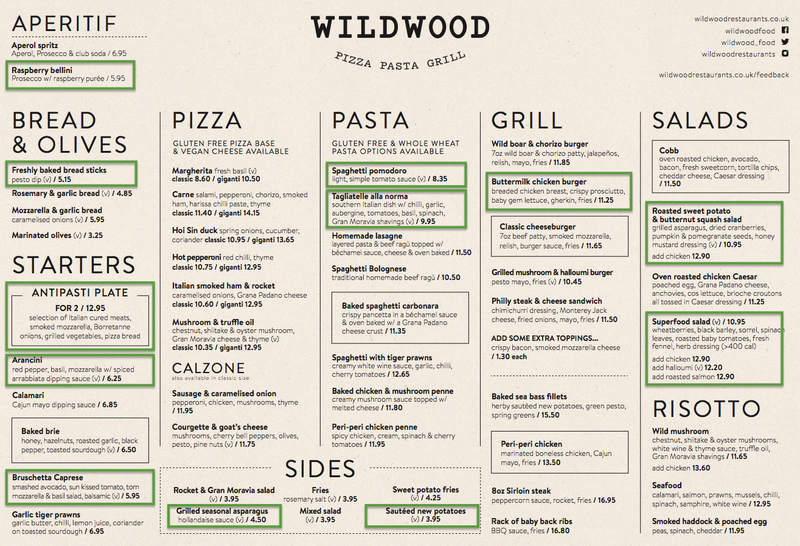 The menu then changed again during October 2018. 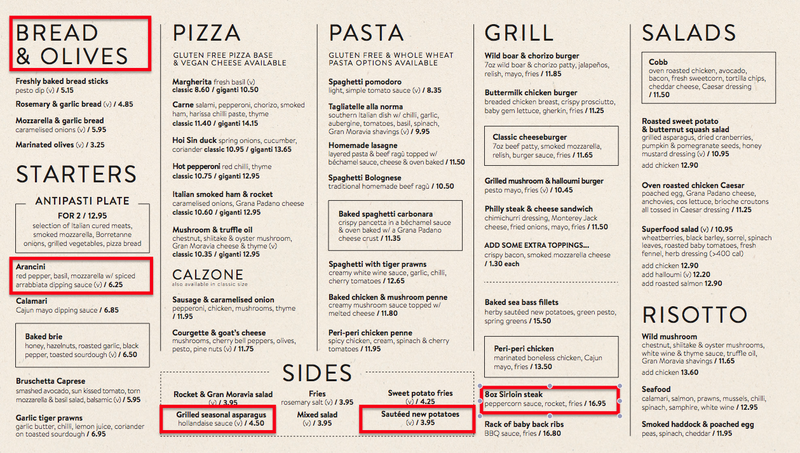 The ‘Bread & Olives’ section has merged with ‘Starters’ and the Arancini dish has now developed into two Arancini dishes (one cheese, one sausage). Two sides have been replaced and the 8oz steak is now 10oz. Starters now include a taleggio/crostini dish, grill dishes can now be purchased with sweet-potato fries, while smoked haddock & fish cakes and a chicken & cumberland sausage risotto have been introduced. I estimate prices have been lifted for a third of the dishes — increases range from 5p to 40p. Of the dishes I mentioned in the blog post above, the brie has advanced a further 25p to £6.75, the fries have stayed at £3.95 while the 8oz steak has been increased to 10oz and the price lifted a further 100p to £17.95. All told, nothing too radical with the menu changes. I suppose the ongoing changes should be welcomed as the managers test new dishes to find new dining winners. Just a quick double-check of TAST’s restaurants before the publication of the group’s 2018 results (due anytime). My last proper site review was this time last year and showed 55 Wildwood sites and 6 dim-t sites. The last interims showed 54 Wildwood sites and 6 dim-ts. Now the Wildwood website shows 52 sites. South Woodford and Cobham have closed since the interims. Last year the results were issued on 13 March, so thee 2018 figures have taken at least a further week to finalise. Not sure if ‘bad numbers take longer to add up’ is relevant here. The proposed £0.5m cash injection from the directors is lingering in the background, as is the Richoux de-listing. Well the SP certainly took a tanking. Not bad results in my mind considering they closed 5% of outlets. There always seems to be some excuses as to why sales were less than desired, World Cup, harsh winter, Brexit. All true but that’s business life. Bottom line the restaurant scene is not what it was when Tasty started out with good quality fierce competition and joe public more decerning on what he eats and where he eats.